Join at the $5 Legendary tier and get a digital edition of our magazine sent to the device of your choice. You might've seen banners mentioning the PC Gamer Club at the bottom of articles as you've been browsing the site. We like to think it's a cool way to extend your relationship with us: you can join our exclusive Discord server, get a game key sent to your inbox every month, and get a suite of exclusive skins to use in games like Elite Dangerous and RuneScape. One of our coolest rewards, though, is getting our monthly magazine sent to your digital device each month. 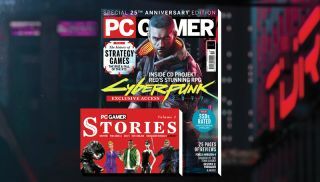 Did you know that, as of this month, PC Gamer is 25 years old? The first UK edition was indeed launched in November 1993, while the first US edition was launched a year later. That's a heck of a long time. Each month, we still work hard to make something that feels special, packed with gorgeously designed, personality-led features, as well as essential reviews, previews and hardware coverage. That hasn't changed in a quarter of a century, and we're proud of what we make each month.